Last update of the week for progress on my "How To Write an RPG" book. I usually write the book and code simultaneously following a plan but for the GUI I've been running ahead on the code a bit. I want to make sure the initial code for GUI holds up well even when things get more advanced. I've added in some tweens for presenting the textboxes, they scale the box and text but could just as easily also change the alpha. There's a stack that the dialogs are pushed on so there can multiple dialogs on screen at once. 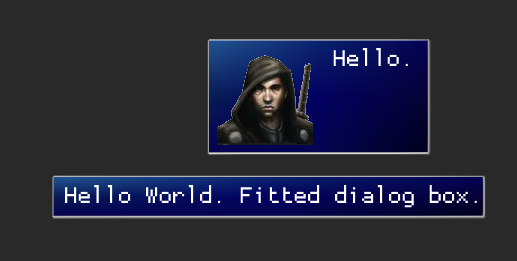 Currently there are two type of dialog, a fitted dialog which fits around the words and an avatar dialog which is the same as the fitted dialog but allows you to add an avatar picture (you'll also be able to add a title / name but I've not quite got there yet). Then I need to add in support for a hard width limit and finally dialogs that breakup a lot of text into several boxes. Then that will be the textboxes done with and on to the other UI elements.I've got work I need to do this weekend but I'll be back on the book sometime on Monday. If you're interested in writing your own jRPG then please check out my book's How To Make an RPG promo site here.